Hello from the coast! No, not the Washington coast but from the Panhandle of Florida and the town of Mexico Beach. What a beautiful place. Did you know that Mexico Beach is home to the largest collection of man made artificial reefs in Florida. What an amazing job this community has done collaboratively to restore and create habitat in places where there was none. These reefs are thriving with fish. Great Job!!!!! The state of Washington could sure take a few lessons from this community. Not much to report from the Washington coast except a couple of productive Clam digs up around Copalis and on Long Beach. Still nothing in sight for the twin harbors but we are hopeful. Crabbing is good when you can get out. Initial reports from the commercial guys is very promising. Use caution however if you headed into the ocean lots of pots around. This time of year many folks will fish the beaches for Surf Perch or the jetties for Rockfish. Both are productive but be careful. Waves and wind can make thing dangerous in a hurry. Ling Cod fishing opens March 12th in MA2 and so is the traditional opening of the charter season. Most offices including myself are taking reservations for the summer season. Weekends and popular days book up fast so keep that in mind. Halibut season is probably full for most already. Tuna fishing starts around mid July. We will not know when the Salmon season will start around mid April after the PFMC meets. If I were a betting man I would guess around very late June. I hope you all are having a productive winter season in the sound and are gearing up for the summer. I will be at a few of the shows and will be at the boat show Thursday February 4th. Come say hi at the Lowrance/Simrad booth. Be Safe, have Fun and we will see you in Westport! Salmon fishing has been fair in the ‘Juans. Right place, right time, there’s some fish. The Roche Harbor Salmon Classic is this upcoming weekend. Picture is Pete Nelsen with the 2013 winner. Good luck Pete, I hope you take 2nd! “No smalls !” We made a quick switch to Hootchies this weekend and even though the hook-ups were far between, our motto of “no smalls” paid off. We focused on Possession and the East bar did the best for us. The red racer hootchie and the new spatter back red racer (OE and Sportco) did pretty well when tied 35 inches behind a purple striped flasher using 50 pound mono. 130-160 feet on the bottom. There seemed to be some shrimp there. This week we plan to move closer to the Port Townsend area in search of some fat feeding blackmouth. Drag em in the mud at Mid-Channel Bank! The salmon fishing is currently closed in area 11 until February but area 13 from the Tacoma Narrows Bridge south is open for salmon fishing. The few reports that I have been getting indicates a few fish being caught recently. 2 anglers out last week due to weather with a 5 pound blackmouth being caught at Fox Island. Also try trolling Pt. Gibson, Green Pt. and the mouth of Wollochet Bay also mooching Pt. Gibson can be productive. For more information call 253-591-5325. The Squid fishing is slowing some with it picking up some today at the area docks but Squid fishing time is running short. For more information call 253-591-5325. Great Seahawks Tek Fit t shirts and hoodies in safety reflective and yellow for the Seahawks fan Call 253-591-5325 or visit us on Facebook “Point Defiance Marina” See you at the Sportsman show next week with some good discounts. 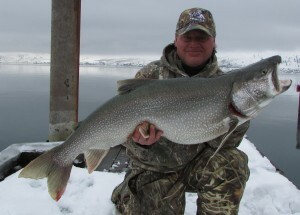 What’s hot into the middle of January is trolling the Barrens for Lake Trout on Lake Chelan. Heating up is catching Kokanee uplake from the Narrows, trolling in depths of 100 to 500 feet deep. Also hot, for those of you longing for a warmer climate is trolling for multiple species out of Cabo San Lucas. Working depths of 185 to 210 feet in the Barrens at speeds of 1 to 1.2 mph within 5 feet of the bottom continues to be very productive. Jeff’s Drifts and Mack’s Lures Cha Cha Squidders have produced numbers of fish from two to five pounds as well as a monster Mack. Up above the Narrows, fish Colyar’s ledge with Mack’s Lures mini cha cha Squidders in orange and pink for nice kokanee. Bait those lures with Pautzke’s Fire Corn. The odd suspended Mack or fin clipped cutthroat is a bonus. You should fish just above or through suspended schools from 50 to 220 feet deep over bottoms from 100 to 500 feet deep. Guide Jeff Witkowski with his 27.6 lb Barrens caught Mack! Slow trolling live baits on either the Sea of Cortez or Pacific side of Cabo San Lucas produced 13 species of fish in a week of fishing. Dorado and wahoo were the most common fish, with a whopper Striped Marlin and an ultra light gear Rooster fish thrown in for good measure. It was a great break from winter! Your fishing tip of the week is to remember scent when fishing. We like to smear all our hard lures with Pautzke’s Krill Juice for trout and salmon. We believe this works as a cover scent so fish committed to biting will not shy away at the last moment. The kid’s tip of the week is plain common sense. Since kid’s bodies have less mass than ours, they are less tolerant of cold than adults. Give them an extra layer. Build a warming fire where safe and legal. Take warming breaks in the vehicle where fires won’t work. Keep the sessions short. Make sure it is fun so they will want to do it again. Especially pay attention to their fingers and toes. The safety tip of the week is to use this slower time of the year to make sure your safety gear has been checked and is in shape for the peak boating season. Fire extinguishers need to be recharged and inspected. Replace used or worn items. For us that is usually band aids and anti-inflammatories like aspirin, Tylenol and Ibuprofen. Check lifejackets and throwable cushions for worn spots and tears to be repaired or replaced as needed. Make a list and check the items off. Nothing has really changed here with winter weather remaining. Most every day there is fog from morning till dark. Temperatures are 30 to 36 degrees with the snow slowly going away. More snow is forecast at the end of this week. Ice on the lakes has not gotten better but seems to slowly be getting less. We are seeing more deer in our area as they spend daytime in the trees and at dusk make their way to the alfalfa fields to dine. On our trail camera we have seen as many as seven at one time. More snow is forecast, not like last year with no snow or ice and walk in lakes were very good. Change should be coming. Winter chinook fishing in Howe Sound and the Gulf Island’s has remained productive. We are seeing a mix of legal and undersize fish and on most day trips we are seeing 5 to 12 hook ups. There has been some really nice fish caught this week, including a spectacular 28 pound Chinook Salmon caught by one of our colleagues. We have heard of a few other fish in the 20 plus pound range caught in Howe Sound. Salmon fishing was GOOD for anglers in East Sooke. Anglers were reporting good success in the bay for springs up to 18+ lbs. Teegan Harding landed an 18.2 lb spring near Lamb Island this past Monday. Inside of Frazer Island and towards the marina has been good. It’s also been good over by the Trap shack and Whirl Bay. Most of the fish being brought back to the marina weigh between 5-8 lbs in size. Anchovies in glow teaser heads have been very effective in luring the winter springs. Spoons, such as the G-Force and Skinny G, in the Bon Chovy or Irish Cream colours were effective. For flashers, the Lemon Lime and the Purple Onion have been good. Salmon fishing was GOOD this past week. Out on the Flats, winter springs were caught fishing with Green Splatterback Coho Killers on the bottom in 65’ of water using Purple flashers and 40” leaders. The fish were feeding on needlefish and Coho Killers in Gold Nugget have been productive too. Salmon fishing was GOOD this past weekend. Those who did go out caught fish that were mostly in the 3-5 lb range. Most of the fish were caught close to the bottom in 120-150 feet of water inside the bay by the Navy Buoy. The trolling pattern has been to do figure eights between the Deep Hole and the Can Buoy. The anglers are fishing close to the bottom are often bouncing the downrigger balls on the bottom. There is also lots of bait right inside the bay, and probably salmon feeding on them there as well. Small spoons, such as the G-Force, Coyote and Gypsy, in the glow and/or any bright colours were very effective. Hootchies and squirts also produced well. Flashers that remain popular include Glow green, Lemon-Lime and Purple Onion. And you can’t go wrong fishing anchovies in a Bloody Nose teaser. Salmon fishing was FAIR near Sidney. Most of the winter springs have been short of the minimum size for retention but we did hear of a couple of 7-8 lb keepers from near Coal Island. Most anglers are fishing using anchovies in Bloody Nose and UV Green teaser heads. Coho Killer spoons have also been working well, especially in double glow and Gold Nugget. Prawning is now closed in Saanich Inlet. The salmon fishing was GOOD recently, but still not a lot of anglers out fishing. 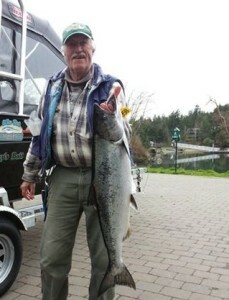 There are lots of small 3-7 lb springs off Sooke right now and not too many larger fish. It’s been good around the 140 foot contour. The 3”-4” Coyote, Gypsy and G-Force spoons, as well as hoochies, are the top choices for Sooke anglers. G-Force spoons in Outfitters, Irish Cream and No Bananas have been very popular. Hoochies in White Glow, Army Truck and Tiger Prawn have been catching their fair number of fish. The most popular flashers recently have been the Purple Onion, the Gibbs Outfitter and the Lemon Lime. Fishing for salmon was GOOD off Victoria. The weather was poor much of the week so not too many anglers were out. The fish have been found just about everywhere at some point, but they are following the bait schools so you might have to move around a bit to find them. The larger fish of last week seem to have moved on and most of the salmon are weighing between 3-5 lbs. Spoons and squirts were successful in getting hook ups. Bloody Nose and Purple Haze have been the most popular colors for teaser heads. Good choices in plastic baits are the Electric Chair, Purple Haze and White Glow. Coho Killers, AP Needlefish, G Force and Coyote spoons in Green Splatterback, Moon Glow and glow white & green colours have also been good. The Purple Onion, Lemon Lime and Bon Chovy flashers have been popular recently. Water levels have increased with the recent rain and the water clarity has decreased. Today the water level is 1.45 meters near Duncan and it looks like the river might blow out. Winter steelheading in the Riverbottom area was slower this past week with the top anglers only getting a couple of steelies per day. We have heard that a couple of 40”+ steelhead have been caught and released so far this month. For steelhead, good lures to fish are Spin ‘n Glo’s, Beads and yarn, Gooey Bobs and the always reliable Pink Worm. Spoons can also be a great lure in these conditions. Fly fishing for brown trout at the top end of the river has been good. Trout fishing was FAIR on most lakes in the South Island area this past week. Cowichan Lake has produced some large cutthroat trout for those trolling 3” plugs, but that is strictly a catch and release fishery for large trout.